Pet Dogs, Problem Dogs, High Performance Dogs. How Science Can Take Your Training to a New Level. Harness the power of science in your training! Whether you’re a trainer, veterinary behaviorist, pet owner, police, military, or scent work training, training methods based on the science of animal behavior can get you astonishingly fast and consistent results. 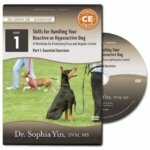 In two fascinating, live-recorded lectures, Dr. Sophia Yin – veterinarian, animal behaviorist, and author – explains clearly and vividly the essential foundations and practical applications of the science of animal learning. From Missle-guiding Pigeons to Spy Dogs; How to use Applied Behavior Analysis to Drive Huge Improvements in Your Training. Harness the power of science in your training! Whether you’re a trainer, veterinary behaviorist, pet owner, police, military, or scent work trainer, training methods based on the science of animal behavior can get you astonishingly fast and consistent results. In this second of two fascinating, live-recorded lectures, Dr. Sophia Yin – veterinarian, animal behaviorist, and author – explains clearly and vividly the essential foundations and practical applications of the science of animal learning. This lecture is the second of two lectures found on the DVD Pet Dogs, Problem Dogs, High Performance Dogs: How Science Can Take Your Training to a New Level. The first lecture from the DVD (which is also available through the Low Stress Handling® University) is titled What Giraffes, Dogs, and Chickens Have in Common: Training Techniques that Work for All.